Bring life and glamour to your home with quality hardwood flooring. Renovations are a great way to update unimpressive décor, and immediately increase the market value of your home. Wood flooring is a classic flooring choice that never goes out of style, and for good reason. We offer stunning collections of engineered and solid hardwood floors for you to choose from. You can visit our showroom and take a look for yourself. We have a grand selection at unbeatable prices in our expansive flooring showroom. With comprehensive access to a large network of industry-leading flooring manufacturers, we are able to negotiate the lowest hardwood flooring prices. Customers continue to choose us because we pass these savings along on all of our high-quality floors. Our buying power allows us to provide you with a wide selection of products, available at the best prices. This dedication to customer service and satisfaction has made us the preferred choice in the area for discerning consumers who want to strike the perfect balance between style and value. Discover the ease and simplicity wood flooring can bring to your home. Hardwood floors do not collect particulates like some other flooring materials, which makes them ideal for allergy sufferers or pet owners. 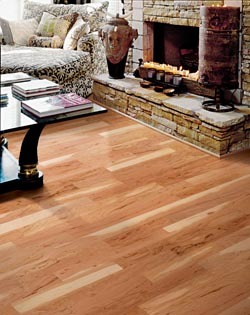 The universal appeal of hardwood is that it adds a comforting, organic feel and an elegant design component to any room. From the warm and traditional appearance of maple or mahogany, to the modern aesthetic of birch, wood floors offer a marvelous range of tone and atmospheric impact. You’ll find the perfect look to add excitement to your existing décor, or become the foundation of a whole new design scheme. Deciding between engineered or solid hardwood floors often depends on the room or area in which they are placed. Both options give your home a sophisticated look, are hypoallergenic, and easy to clean. But which choice is right for you and your family? Our experienced staff is happy to help you determine what style will suit your design goals and practical needs, as well as your budget. Get the true feel of old-world elegance with solid hardwood flooring. Each section is made from one piece of sturdy hardwood. It offers durability and a surface that will maintain its luminous appearance for many years. Homes with this stunning design element evoke the look and quality of family heirlooms passed down for generations. While this flooring can sustain wear-and-tear related damage over the years, particularly in high-traffic areas of a home, it can always be sanded down and refinished to look good as new. It’s almost never a necessity to replace wood flooring. Engineered hardwood floors are made of real plywood bonded with resin to create ultimate durability. They offer the luxurious effect of genuine hardwood with the added benefit of increased resilience. This moisture-resistant flooring is ideal for bathrooms, laundry rooms, or other water-prone areas where excess humidity or moisture are present. It is also easy to maintain in high-traffic areas, like kitchens and foyers. When you visit our expansive showroom, you’ll have the opportunity to browse through hundreds of hardwood flooring options. Our knowledgeable staff is happy to guide you through the wide selection of styles, sizes, glosses, grains, and color variations. From high to low gloss, light to dark finishes, and subtle to prominent grains, we have all the information you need to get the look you want. It’s also our pleasure to explain the details of the warranties we offer. Are you too busy to stop by the showroom just now? Don’t worry, we have an extensive virtual showroom on our website for you peruse at the click of a button. You can wander the store from the comfort of your couch, and when something catches your eye, our team will be happy to help you decide whether it’s the right one for you. Don’t let budget concerns keep you from exploring your options, because our prices can’t be beat. Contact us or visit our showroom today to learn more about affordable hardwood flooring. We proudly serve customers in Otsego, Minneapolis, Maple Grove, Brooklyn, and Buffalo, Minnesota.